Taking a main event fight on short notice didn't rattle former heavyweight champion Fabricio Werdum one bit as he earned a unanimous decision win over Marcin Tybura to cap off the latest UFC Fight Night card from Australia. While he's arguably the greatest submission specialist in heavyweight history, Werdum showed off his striking chops on Saturday night as he punished Tybura round after round with forward pressure and great combinations throughout all 25 minutes. Werdum made Tybura pay with every shot he landed, including several nasty kicks to the body that left the Polish heavyweight with a gigantic welt across his midsection. Werdum kept the pressure on until the final horn sounded as he walked away with a dominant win to mark his second straight victory in a row. While he did accept the fight without a full training camp to prepare, Werdum was an overwhelming favorite according to selections from fantasy players, with 88 percent picking him to win over Tybura. Werdum certainly followed through with another complete performance as he takes one more step towards getting back to title contention. In the co-main event, UFC newcomer Jessica-Rose Clark made the fantasy players who picked her to win very happy as she earned a split decision victory over former Ultimate Fighter competitor Bec Rawlings. Clark was only selected by 22 percent of fantasy players, which made her one of the biggest underdogs on the card, but because she took the fight on short notice, the win was worth an extra 50 points as well as another 120 points because it was a tight matchup. Speaking of upsets, Belal Muhammad got the job done with a split decision win of his own against Tim Means with just 26 percent of fantasy players picking him in this welterweight battle. In his return to welterweight, Jake Matthews picked up a hard fought split decision win against Bojan Velickovic with 75 percent of fantasy players selecting him going into the card. Fellow Ultimate Fighter Nations cast mate Elias Theodorou also came through with a impressive win as he took out Australia's own Dan Kelly by unanimous decision with 77 percent of fantasy players selecting him ahead of the event. In the kickoff fight on the main card, Alexander Vokanovski was one of the heaviest favorites, with 88 percent of fantasy players picking him to get past very late replacement Shane Young. Volkanovski got the job done with a lopsided decision win in front of a raucous Sydney crowd. In the prelims, Ryan Benoit finished Ashkan Mokhtarian with a jaw-dropping third-round head kick knockout to get a win in his latest fight with 74 percent of fantasy players picking him. 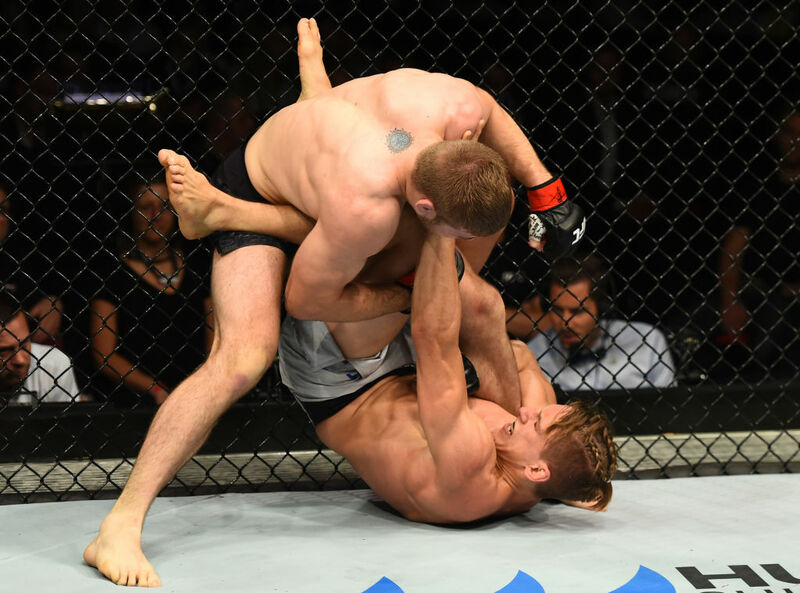 Nik Lentz was one of the biggest upset winners on the card as he took out Will Brooks with a second-round guillotine choke submission with just 17 percent of fantasy players selecting him in the battle between two former teammates. Newcomer Tai Tuivasa started off his UFC career in spectacular fashion with a flying knee knockout against Rashad Coulter with 49 percent of fantasy players picking him while also earning another 40 points thanks to the fight serving as his debut inside the Octagon. With 66 percent of fantasy players picking him, Frank Camacho delivered a win against Damien Brown in an absolute slugfest that ultimately earned Fight of the Night honors. Because it was a tight matchup on paper, the players who picked Camacho also earned an extra 120 points. Nadia Kassem also got a win in her UFC debut with 45 percent of fantasy players picking her against former Ultimate Fighter competitor Alex Chambers in a strawweight matchup on the early prelims. Kassem also earned an extra 40 points because it was her debut. Eric Shelton picked up a win as well in the early prelims with a whopping 80 percent of fantasy players picking him against Jenel Lausa, while Adam Wieczorek kicked off the fight card with a decision win against Anthony Hamilton with 61 percent of fantasy players predicting his victory. On the 13-fight card, eight favorites came away with wins according to the selections made by fantasy players, with five underdogs pulling off upsets at UFC Fight Night from Sydney, Australia.